An inexpensive MIDI controller with useful scratch and mixer controls, for DJing, live laptop performance, and VJing? We’ve all been anxious to know whether the BCD2000 delivers. Our resident live visualist gives it a spin (so to speak). After waiting over a year, I finally have it. The Behringer BCD2000 was announced in January 2005, initially shipped small numbers in August, and then incessantly delayed until finally being delivered worldwide in late April 2006. Considering that the device has been in the wild for over a year there is a surprising lack of information online. Not that it was a nerve-wracking purchase decision at AU$265 street (US$200), but I couldn’t do the usual review harvest before picking it up. 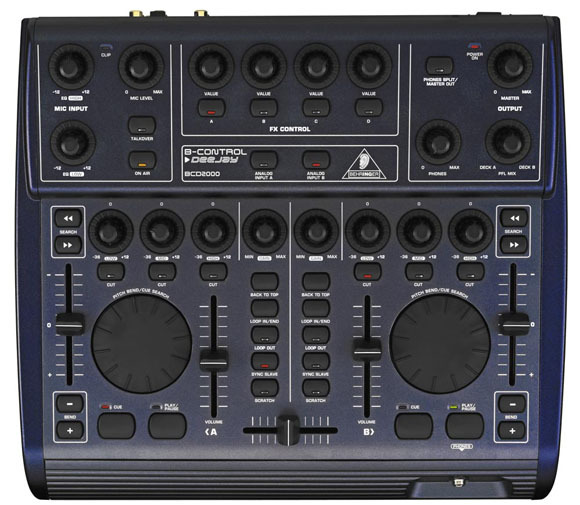 I was looking for a midi controller to compliment my BCR2000 and bridge the VJ/DJ divide. I think I may have found it. If you’ve used a Behringer MIDI controller such as a BCR before, then this will be very familiar. The plastic BCD knobs and sliders aren’t as silky smooth as higher-end offerings, but they are rather chunky, which is great for a live performance environment. As the BCD rotaries aren’t endless, Behringer haven’t included the excellent LED rings seen on the light-tastic BCR. Instead, they’ve opted for a more traditional bump and a normalling detent on those controllers that need to be zeroed, such as EQ and gain. The cross- and upfaders are smooth and move quite freely, not as quick as a real DJ mixer, but definitely faster than the BCD’s main rival in the price range, the M-audio X-session. I was pleasantly surprised by the pitch controls which have a firm, precise action and “quartz lock” style detent. The buttons are ok; they’re not velocity-sensitive, but do have a good solid click when pressed. Overall, though, build quality is good. The steel chassis of the B-control series lends a hefty, solid feel, so you’re not afraid to bang away at them if the mood takes you. My BCR2000 is over a year old and has been lugged around the world in suitcases and backpacks to little ill-effect. I expect the BCD to be similarly robust. One small but frustrating issue for the whole range is the included, pathetically tiny rubber feet. These adhere to the device’s own small plastic “legs” and it should take around 1-3 gigs before they’re knocked off through enthusiastic use and the controller starts to slide away from you. This isn’t a worry if it will be spending its life on a desk, but if you’re going to venture out of your studio with it eventually you’ll need to replace those feet with something more robust. The legs stand out by 5mm, but don’t have enough space to stick on a standard adhesive rubber dot, so I’m still looking for a suitable replacement. Interface is via USB1.1, and, happily, the included BCD2000 Control Panel drivers are relatively innocuous. The drivers install easily and without excess baggage. They’re ASIO- and WDM/MME-compliant, and allow you to change ASIO latency and select in/out channels. Ed: Behringer has previously supported Core Audio on the Mac, but doesn’t appear to have any Mac drivers in this release. 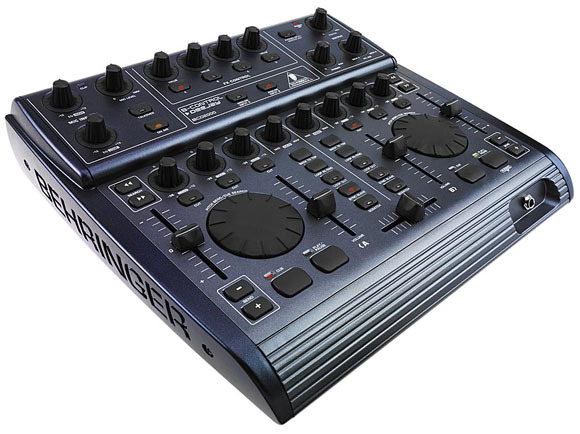 -PK The device is also switchable between B-DJ mode (for use with the included B-DJ software, put together by xylio) and Advanced mode, for use as a MIDI controller/soundcard with other programs or devices. I’ve been using the BCD as my primary sound source since I picked it up, and am quite happy. As I’m not a musician or producer by trade, I don’t have a professional soundcard to compare it to, but if you’re used to an on-board or low end card such as Creative or Hercules produce you shouldn’t have any complaints. I’m not going to go all stereophile on anyone; but running through rather nice, vintage NAD amps and Wharfedale speakers gave me plenty of clean, distortion free sound. This thing will be fine for DJing with MP3s, and I’ll venture it will serve well with club soundsystems. One possible issue for gamers: The BCD doesn’t support EAS, so games with hardware accelerated sound may not work properly, causing slowdowns and other unhappiness. I’m quite happy to switch back to on-motherboard sound for the occasional Oblivion session, but if you’re looking for a gaming soundcard, this may not be the product for you. Headphone output is 1/4″ and drives well past my pain threshold. I can’t be sure that it would be enough if you were wedged between ceiling-high stacks of speakers, but it’s plenty to give you tinnitus in the privacy of your own studio. Noticeably absent from the connection options are MIDIs In, Out, and Thru. I suppose as it’s designed for soundcard use as well the BCD will generally be plugged into a computer, but it would be nice to have the ability to connect other MIDI devices into it, rather than taking up more USB ports and requiring 3rd-party software to rout MIDI messages. One of the great features of the BCR and BCF is the included BCEdit software, which allows you to customize and save presets for every knob, button or fader on the device. You can choose the MIDI data type, send channel, note or controller number, value display, min and max controller value, LED ring display or button LED toggle, and so on. It’s a little clunky, but magnitudes better than the on-board configuration of many MIDI controllers. So you’ll understand my profound disappointment when I discovered that the BCD has none of this customization available. All button and controller assignments are fixed in the device. So, instead of a happy lovefest of simple customisation, the first thing I encountered online as a new BCD owner was this 14 page thread on the Native Instruments forum about getting the BCD2000 jog wheels to work correctly with Traktor. Some clever types figured out a combination of Bome’s Midi Translator and Midi-yoke to get some useful control out of the jog wheels, and DJ Fresha’s ninja setup with Midi Translator 1.5 beta to use them for scratching in Traktor. Fortunately for me the jog wheels work fine out of the box for scratching in Resolume, but I don’t think VJs are the BCD’s primary target market, so if sound is your thing you might need to do some translating. Throwing Bome’s Midi Translator or Hubi’s Transformator into the mix opens up a whole world of customisation, which I shall leave for another article. We’ve got a review copy of Midi Translator Pro, which has some very interesting features, so expect a look into that soon. The short version is this: As shipped the jog wheels are infinite rotaries sending CC19 and CC20, velocity 64 (move anticlockwise) velocity 65 (clockwise). If your program of choice can do useful things with this information: Congratulations. If not, get mapping or wait for Part 2 of this article. So, should you get a BCD2000? If you’re looking for a cheap entry into digital DJing: What are you waiting for? Go, now. If you’d like a cheap midi controller/sound card to integrate with your existing software setup: This may be what you’re looking for, but some more research for your particular needs may be in order. I’ll have more to say on advanced uses and midi translation soon.